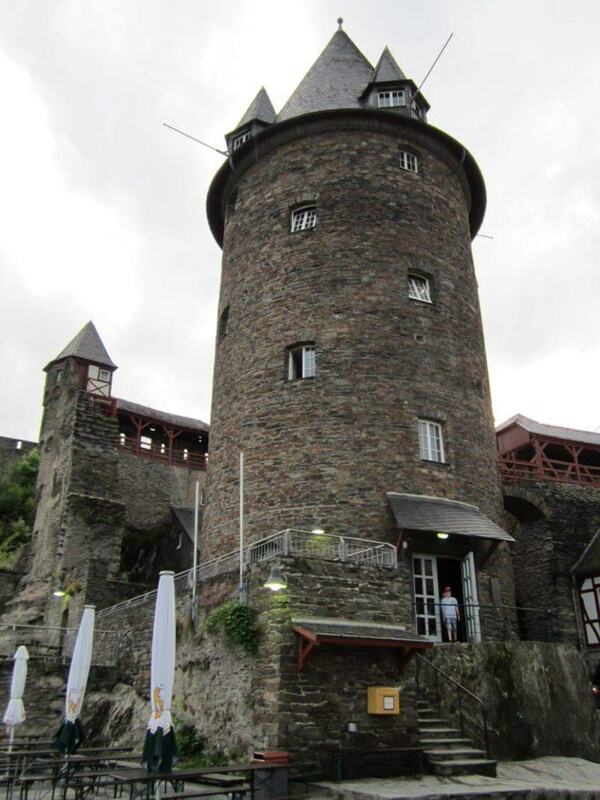 Our first stay in a hostel was at Jugendherberge Burg Stahleck in Bacharach, Germany along the Rhine River. Not only was it our first hostel stay, it was also our first time sleeping in a castle! 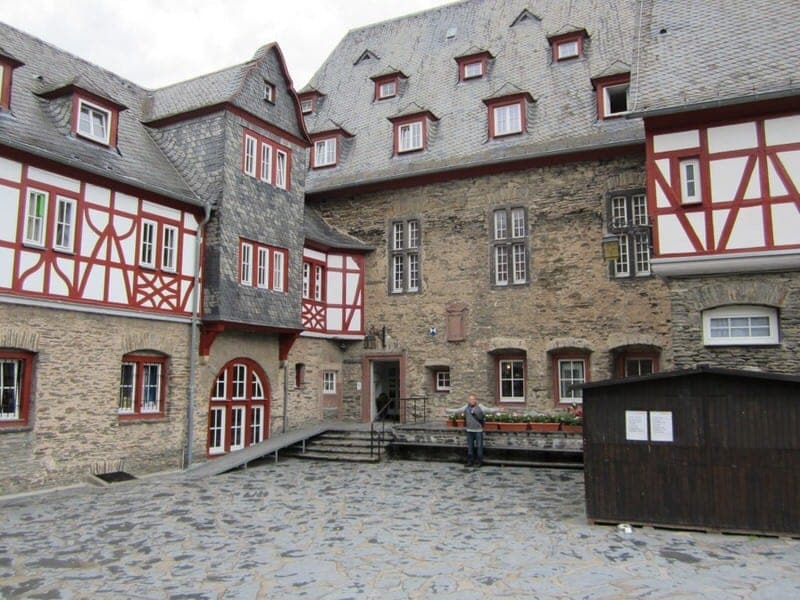 That’s right, Burg Stahleck is a 12th-century castle that has been converted into a hostel with over 150 beds. 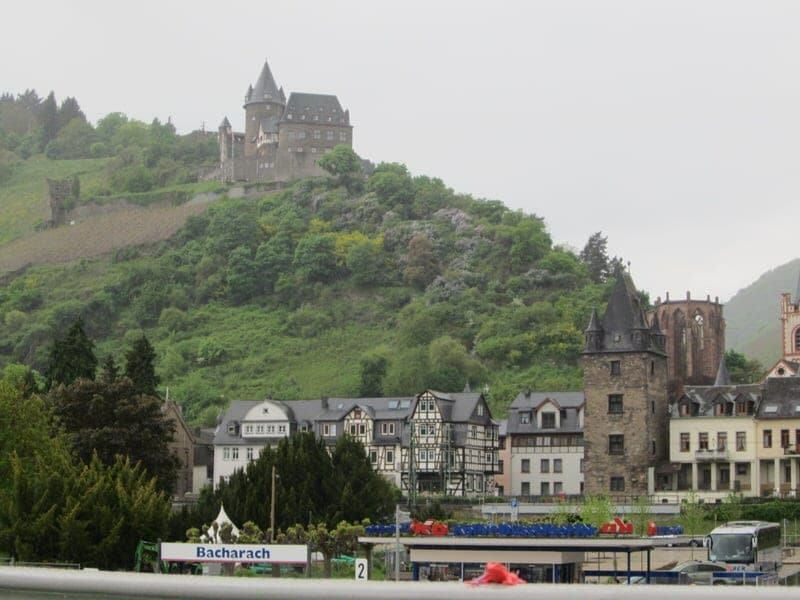 It sits on a hill overlooking the small picturesque German town of Bacharach along the Rhine River. The exterior is all castle, but the interior is all hostel. A castle stay at hostel prices, what could be wrong with that? 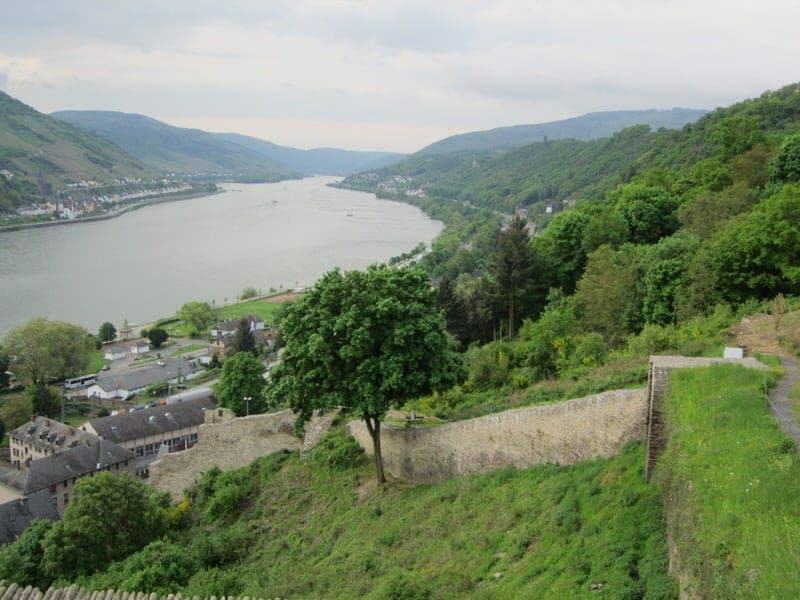 If you are interested in a stay at Jugendherberge Burg Stahleck or just plan to stop by for a drink to take in the view, we’ll give you the details on how to find the castle, how to book a stay, and share our experiences of spending two nights at this castle hostel located in the heart of the Rhine Valley. If arriving by car, there is free roadside parking and a parking lot located past the driveway entrance to Burg Stahleck. Go past the driveway turnoff and continue up the road to park alongside the road or further up the hill at the parking lot. You can then reach the hostel by walking down along the hill and following the driveway to the hostel entrance. If you are arriving by train, stop at the Bacharach station. You can walk to Burg Stahleck, but if you have luggage I would recommend taking a taxi which should be under 10 euros. Plan ahead and have a taxi waiting, call one once you arrive, or plan to walk to town to call one as the station is small and there were no taxis there during any of our visits. Boat? 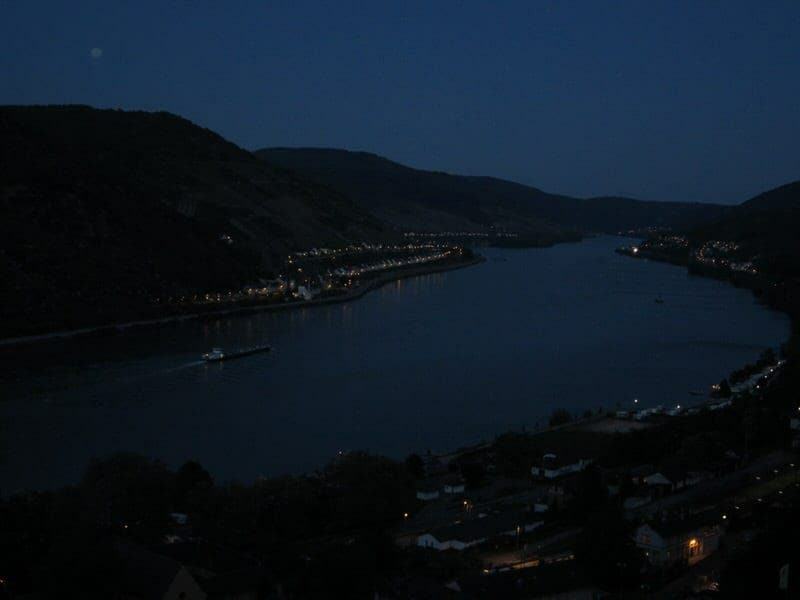 Almost all the Rhine cruise boats make stops at Bacharach. Again, if you want to reach the hostel plan to trek up the hill or you can take a taxi. Walking to Burg Stahleck? The longest but easiest is by following actual roads as you would by car, but this would take a long time. So unfortunately the two practical ways are directly up the hill. First take a look at the Bacharach city map. TRAIL OPTION 1: The first trail is closest to the train station and begins off Oberstrasse. Look for the stairway to the left of the house at Oberstrasse 2 and then follow the fairly well-marked trail that follows alongside the site of the old town wall (some parts still remain) up the hill to the back side of the youth hostel. You can continue to follow this trail past the hostel if you want to see more of the vineyards and town towers. TRAIL OPTION 2: The second trail (may be marked as Footpath Stahleckpfad on a map) is located more in the middle of town and begins off Oberstrasse near the Church of St. Peter (the stairs are located between the church and the Tourist Information Office). The trail does branch off, but just keep following signs marked Jugendherberge. There are over 300 stairs but there is shade and places to stop and take a break along the way. The reception desk is open from 7:30am-8:00pm (7:30-20:00) each day, but later check-ins can be accommodated in the bar area. E-mail or call ahead if you need to check-in later. You can book online using their website, over the phone (06743/1266), by fax (06743/2684) or by e-mail (bacharach@diejugendherbergen.de). The 2013 prices for adults and children age 15 or older are: 20,50 euros for a single bed in a shared 4- or 6- person dorm room, 32,50 for a single bed in a private room:, 52 euros for a private double room for two people. Family rooms can also be booked. Children age 0-3 stay for free and children age 4-14 stay for 10,25 euros per night. All prices include breakfast. You can also add a buffet-style lunch or dinner for the half-board option for 7,50 euros per person age 15 or over or 3,75 euros for those age 4-14. You can also do full board (includes lunch and dinner) for only a few euros more per person. Children age 3 and under eat for free with paying guest. However, to stay in this hostel you have to be a member of a Youth Hostel Association. If you are not a member and are not a German resident, you can purchase an International Hostelling Guest Card in place of membership and it costs 3,50 euros per night per person. This Guest Card is valid for 12 months. 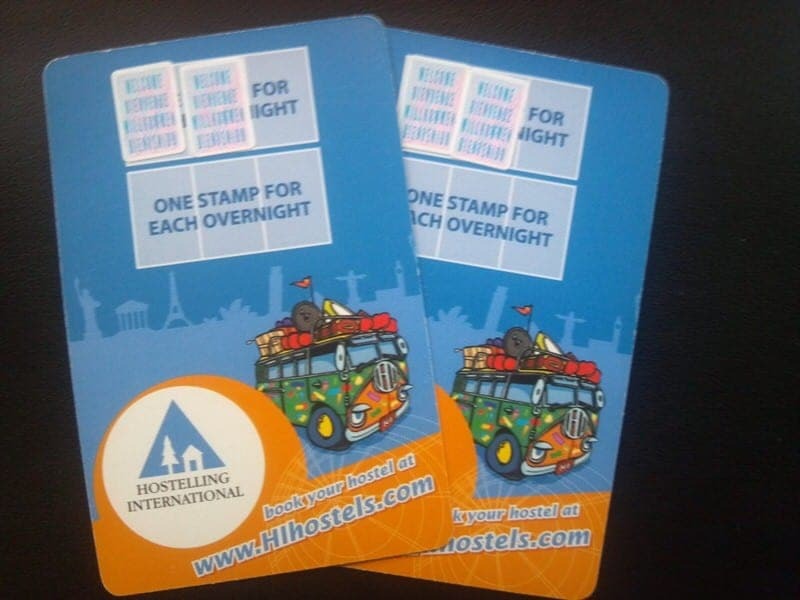 If you stay 6 nights or more nights in hostels within the Hostelling International Association, the Guest Card becomes valid in all Hostels worldwide or entitles the holder to reduced rates for his/her stay. We were not members of any hostelling association and we did this option which added an extra 14 euros total to our 2-night stay. Your room price includes breakfast, bed linens, a pillow, and a small towel. Some rooms have their own private bathroom and shower, but some are shared. Computer access, wi-fi access, and laundry are available at a small fee. A dining area and café/bar provide food and drinks and there is an outdoor sitting/picnicking area in the courtyard. Various games and activities are available for children and families, and you can also book rooms for special events, banquets, and conferences. • Book well in advance, specifically if you want a private single or double room or plan on an extended stay. Some dates fill up 6 months in advance given that this is a very popular place for school groups and there are only a limited number of private rooms. • If you want a specific view or en suite bathroom, request it at time of booking. • Purchasing the full board option is financially a really good deal, but unless you want to eat all three meals a day here, I would opt for eating at least one meal a day elsewhere. The food is OK, but eating cafeteria quality food all day might start to get old. • Even if you are not staying here, you can buy snacks and drinks from the bistro or café-bar during the day or evenings and enjoy the view from the courtyard. Food, wine, beer, soft drinks, and coffee are available for purchase. 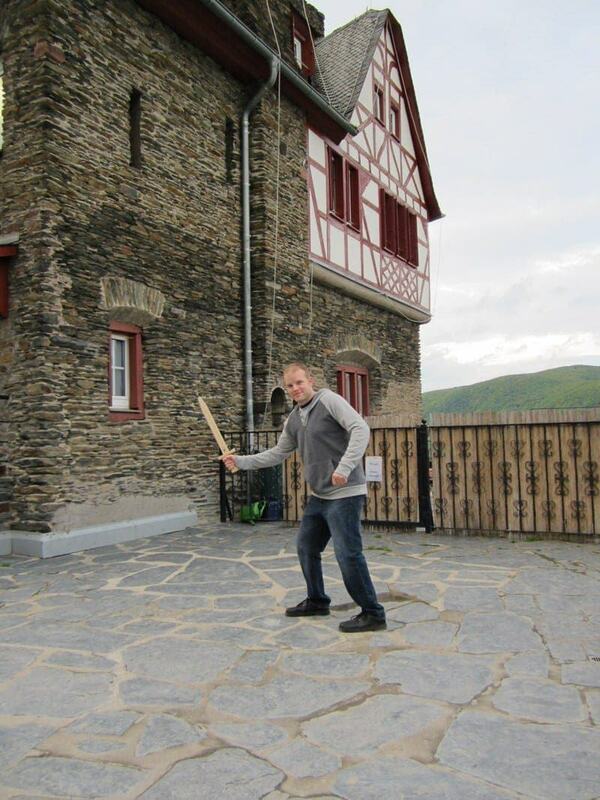 • The Tourist Information Center in Bacharach can provide some good city and hiking trail maps. There are some great longer trails you can take to other castles and nearby towns if you are looking for longer, more challenging hikes. For a basic city map check out this map of Bacharach. • The walk up the main steep path (described as TRAIL OPTION 2 above) has over 300 stairs and can be really tough, especially for those not in great shape. But just take your time, take some water, and take breaks. There are a few places to stop off and enjoy the view or take a break on a bench. We took both paths during our stay. If we were going to the train station we took OPTION 1 and if coming from or going to the main part of town we took OPTION 2. Both are a lot easier going down than up, but give your legs a really good workout! • For those with physical limitations, you’ll probably want to drive or call a taxi to get to and from the hostel. If this sounds inconvenient, I would consider staying elsewhere. 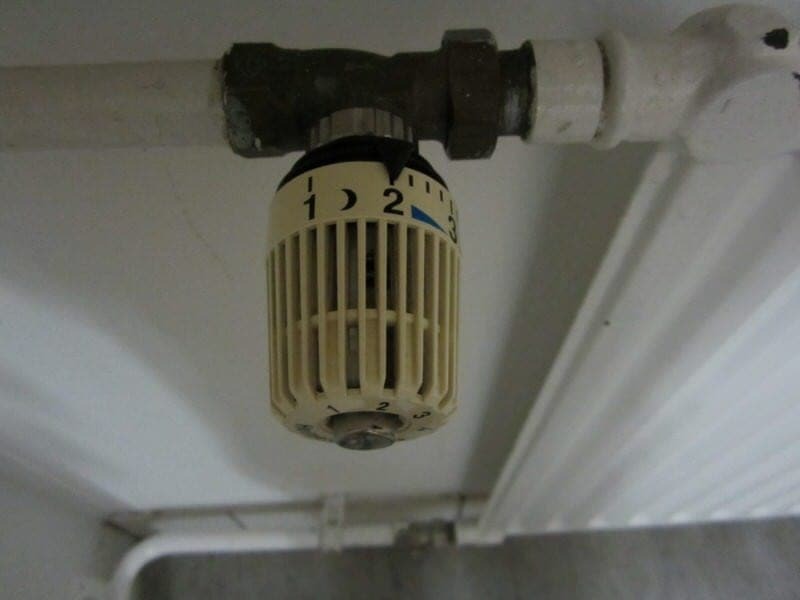 • Curfew is at 10:00pm (22:00); however, our room key unlocked the exterior side door next to our room. So you might want to ask if you will be able to enter the hostel after curfew or not. • There are lots of fun things for kids to do at the castle. There are plenty of board games, arcade games, and toys available for children. There are also ping pong (table tennis) tables outside. We even saw a school group rig up some climbing gear and kids were able to climb the side of one of the walls under the supervision of their teachers. Many kids were happy just running around with plastic and wooden swords pretending to be knights. • If you are feeling overwhelmed by school kids or tour groups and are looking for a peaceful place to sit and think or read, try taking a walk around the back of the castle. There are a couple of benches back there that tend to be empty and quiet. • The castle has a very interesting history and has been under the control of the Wittelsbachs, French, Prussians, and Nazis among others. I found that reading about its history made me better appreciate my stay here. There are some good books to be found in Bacharach or you can read a good overview of Burg Stahleck on Wikipedia. We had spent the previous evening in the Mosel River Valley in the tiny town of Beilstein and had a rental car to get us around. 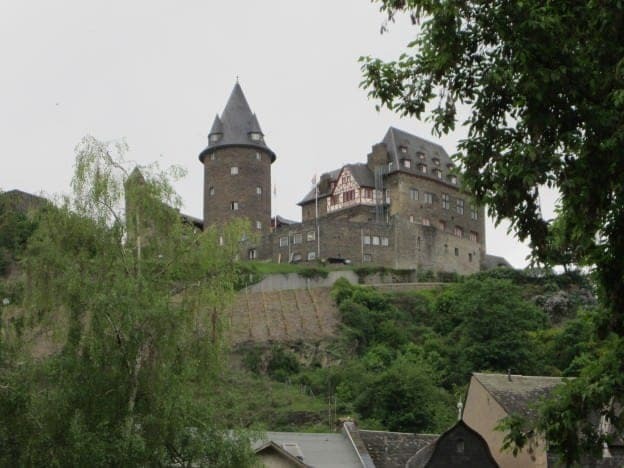 On the way to Bacharach, we stopped at the impressive Burg Eltz and then drove to Burg Stahleck. There were a few twists and turns of the road but we didn’t have too much trouble finding the hostel with our GPS. We drove past the driveway entrance to Burg Stahleck as instructed and found parking within about 100 yards alongside the road. There is a great lookout area at one of the turns in the road so we stopped for a quick photo opt here. Then we got our luggage and walked back down to the driveway entrance and headed for the castle. Continue until you get into the main courtyard and you’ll see the entrance to the front desk. The rules of the stay were explained at check in such as dining times, check out times, where to put dirty linen, etc. We also learned that we needed to purchase an International Hostelling Guest Card since we were not members of a hostel association. This was unexpected and added an extra 14 euros to our 2-night stay (3,50 per person per night). We paid 104 euros for the room plus the 14 euros for the guest pass for a total of 118 euro. Although I was a bit annoyed about the extra 14 euros, you really can’t beat staying for less than 60 euros per night for a double room in a castle. You can also then use this pass for other hostel stays although we knew we were not planning any other nights in a hostel during our trip. While the exterior of the castle looks like a castle, the inside looks like a hostel. The hallways are narrow and low and some can be quite dark so watch your step at night. We had requested a room with a view of the Rhine well in advance and this was confirmed via e-mail; however, while we got the private 2-person room that we requested we did not have a view of the Rhine. When we asked to see if we could be moved to a room with a view as requested, we were told that there were none available and they were not able to accommodate our request. Our room was small with two single bunk beds, bed linens, two small bath towels, a sink, wardrobe, mirror, and a small table with chairs. The linens and room appeared clean with the exception of one of the towels which had several black hairs on it which we exchanged. We did not have a private bathroom, but shared toilets and showers that were up a short flight of stairs. The shared facilities were clean and we never had a problem using them during our stay. Our room was also on a section of a floor with only one or two other rooms so it was quiet and right next to an exit door. One thing I really liked was that there are little shelves with reading lamps above our beds which were nice so we didn’t have to get up to turn on and off lights and provided a good place to set our books, phones, and travel alarm. I do want to comment on the number of children that you are likely to encounter. 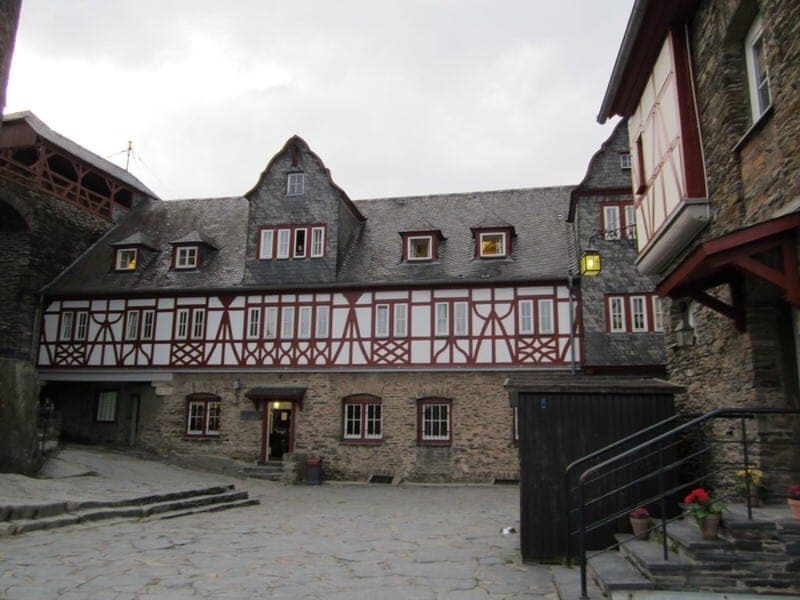 There were a lot of German school children staying during our visit and often the dining hall and courtyard was swarming with noisy kids and overwhelmed chaperons. But they all tend to leave early each morning (often with packed lunches) so you can generally avoid them at breakfast if you go a bit later and we never had a problem finding a place to sit in the courtyard in the evenings. Some guests did note difficulty sleeping due to being uncomfortable in the beds or noise from neighboring rooms, but we slept fine. I am a light sleeper and always travel with earplugs, but we never heard our neighbors with the exception of the sound of their sink and closing of their door. We ate the included buffet style breakfast both mornings of our stay. The breakfast includes the common German staples of meat, cheese, cold veggies, yogurt, and breads. Coffee, tea, juice, and milk are available for drinks. We also bought coffee twice and food once in the evenings which we took and enjoyed outside in the courtyard where there are a number of picnic tables. The coffee drinks was very good and the food was mediocre. If you are prepared for cafeteria quality food, you won’t be disappointed. My favorite part of the stay was in the evenings before bed when we would sit until it got dark outside sipping coffee or hot chocolate and enjoying the beautiful views of the Rhine Valley. Overall, if you want the experience of staying in an authentic castle and don’t mind hostel style accommodation, this is a great place to stay. However, if you are looking for more comfortable accommodations, restaurant-quality food, or an oasis of peace and quiet this may not be the best place for you and there are other castle hotels along the Rhine that might be a better match. From our perspective, the cons of staying here is that it is fairly basic hostel style accommodations, the food is so-so, it is a long hike from the main part of town, and it can sometimes be overrun by schoolgroups and tour groups. The pros are the good prices, the chance to stay in a 12-century castle, free breakfast, food available throughout the day, and the amazing views. Walking up and down that hill also gives your leg muscles a really fabulous workout! Overall, while there were definitely some drawbacks, we enjoyed our stay and would return. Sitting outside at sunset sipping coffee, writing in my travel journal, and enjoying the views with Ethan are some of my favorite memories of our time in Bacharach. Have questions about our stay at Jugendherberge Stahleck? Have you stayed here? We’d love to hear from you. Thank you for your review. Years ago I was in the IYHA and stayed in this area. At that time it was for youth and seniors. Now I find myself 72 and wonder if seniors are still allowed to be part of the Hostel program? Would you have information about this or know where I can find it. Thank you. Loved this hostel years ago! It’s worth the hike up the hill! Very beautiful area. Place was clean!!! I was really needed a good review about Burg Stahleck and you have done it really well. I am really thankful to you. Most of the sites are in German so your articles helps me so much. Thank you again. I see that you had a enjoyable time and I can make a wonderful trips just as you did…. Absolutely loved this post. I just wrote a full post about doing Rhine Valley on a budget based on a recent trip and I refer readers to this post to read more about the castle! 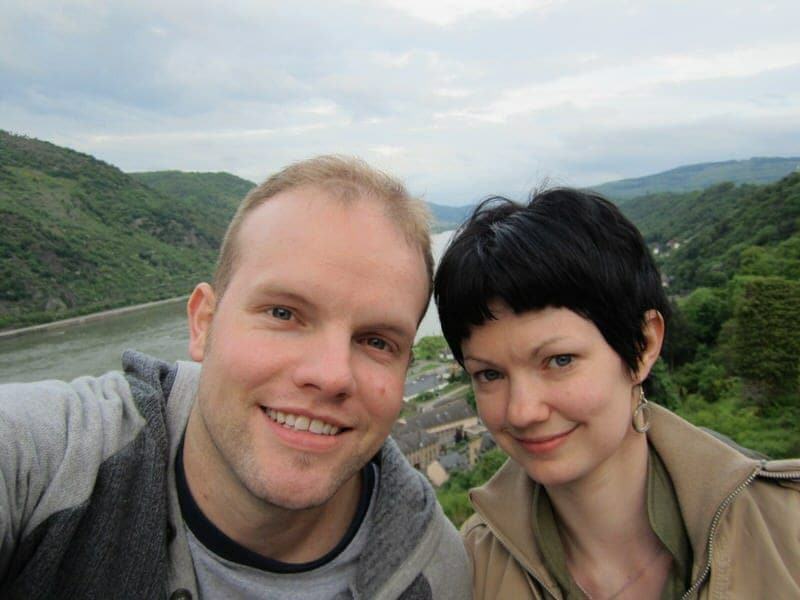 In March of this year I was trying to plan a short Rhineland trip for my 30 year old son and myself. I Googled endlessly and didn’t come up with many useful sites other than castle ruins. I switched to Yahoo, and yours popped up on the first try! Hmmm. Anyways, based on your post’s information, I booked a room here for June. We loved saying here! Thank you so much, Your directions to the castle and to the parking were spot on. The castle was fun to stay at and the service was great. The view was tremendous. The children staying here really enjoyed themselves. Also, the town of Bacharach was incredibly charming. We wouldn’t have even driven thru it if it weren’t for your post. My son and I are hoping to come back in a few years when my grandson is old enough to enjoy it. I think my boyfriend has stayed here before… he goes on a practice weekend with his choir every year and for 2 or 3 years they always stayed in a hostel that was a castle. It could well have been this one. I’m so jealous! Those views are spectacular. Yes, there are a few of these castle-hostels I think. It is so wonderful that awesome historical buildings like Burg Stahleck are being used for hostels and such so that people can enjoy them. The views here are just spectacular. 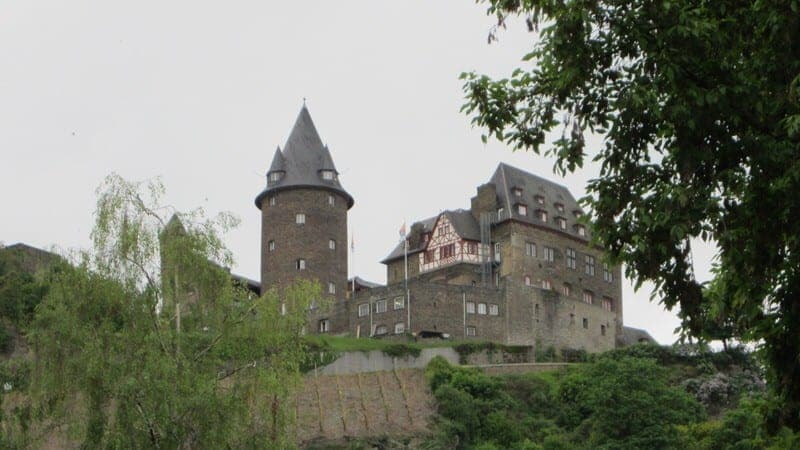 The castle is Mannheim is now part of the university… imagine studying there? That does look like a great place to stay! You had me at “hostel prices” 😉 The view looks incredible! Yes, we really enjoyed it and the views are amazing! I was so excited when I saw you wrote about Burg Stahleck! 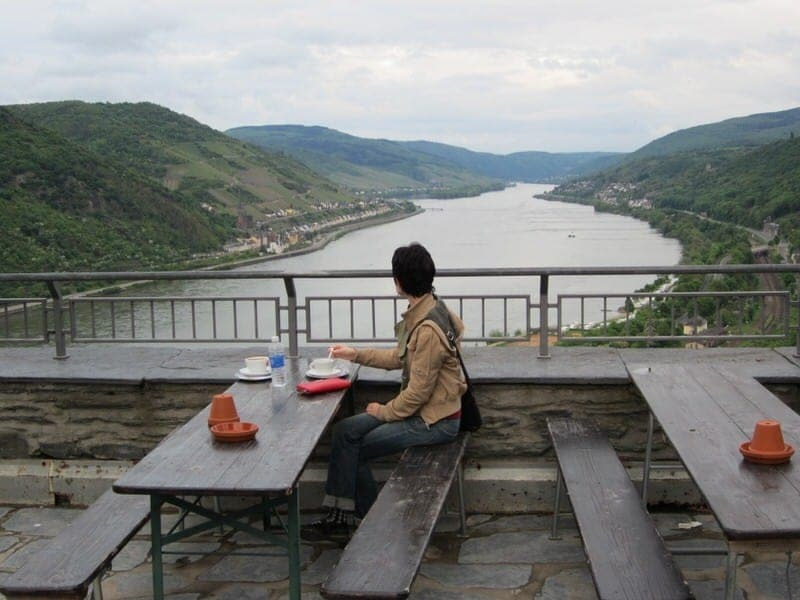 I stayed there and found it to be a great place from which to explore the Rhine region. You noted two of the biggest downsides I found: the steep climb (we were traveling by train so we didn’t have the luxury of driving up the hill) and the groups of schoolchildren (I wonder if they are there year-round?). It’s too bad you guys didn’t get your room with a view, but I hope you got to see some of the great views from outside the castle. Overall, I would say this is probably one of the cheapest way for travelers to experience sleeping in a castle. Thanks for writing about it! Glad to hear that you enjoyed your stay there overall as well. Yes, those hills are tough but good for working off all that German food. I bet schoolkids are here most of the year–it is just such a perfect spot for them! !